Sam Kirmayer is a guitarist and composer based in Montreal. Inspired by masters like Wes Montgomery and Grant Green, Sam maintains firm roots in the blues and hard bop traditions. 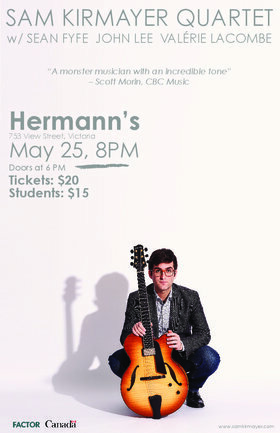 He was included in CBC Music's list of “The 35 Best Canadian Jazz Musicians Under 35”. Sam’s first tour of Canada’s west coast follows up on the 2017 release of his debut recording, Opening Statement. With Sean Fyfe (piano), John Lee (bass) and Valérie Lacombe (drums).